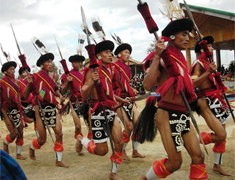 Nagaland, the16th state of the Indian Union was born on 1st Dec1963. It is bounded by Assam in the west and north Tirap district of Arunachal Pradesh in the north east, and Manipur in the south. On the east it shares India's international boundary with Myanmar, Burma. 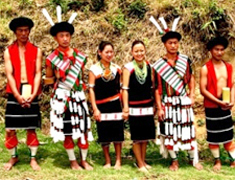 The state is divided into Eight districts : Kohima, Phek, Mokokchung, Wokha, Zunheloto, Twensang, Dimpur and Mon. The terrain ishilly, rugged and mountainous. 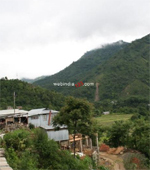 The highest peak is Saramati in the Twensang district which is 3840 metres above sea-level. The average height of the peaks is between 900 and 1200 metres. 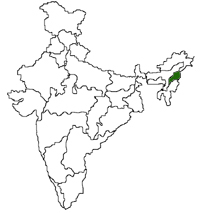 Nagaland has basically an agricultural economy. Over 70% of the population is dependent on agriculture. The main rivers that flow through the state are Dhansiri, Doyang, Dikhu, Tizu and Melak. There is no waterfall in Nagaland. The only lake well known is Lacham to the east of Mehiri. The hill sides are covered with green forests. In the Angami region, the terraced fields are a feast to the eyes.